The landing area at 8 is a high traffic area that stays wet from rain and water running down from the hillside beside it. We have installed drainage to help solve this problem. 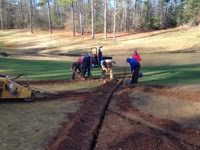 It will also help with balls approaching the greens complex. 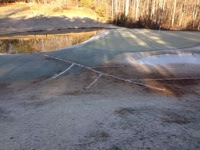 We will continue our topdressing program to all approach areas to aid with smoothness, drainage and firmness. 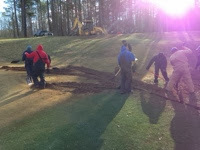 Trenching through the ryegrass approach area.